Last week a California judge decided that bad teachers can be fired. In his decision in Vergara v. California, Judge Rolf M. Treu dealt a severe blow to the power of teachers’ unions. Not surprisingly, conservative intellectuals rejoiced. For almost a century, conservative school reformers have insisted that teachers’ unions represent a double-headed threat. But here’s my question: why do today’s conservatives only focus on one half of their traditional gripe against teachers’ unions? In Judge Treu’s decision, he argued that ineffective teachers have a negative impact on students. And since the poorest students suffer most, the judge concluded that the situation was open to judicial remedy. In the pages of the conservative National Review, writers celebrated the decision. One “liberal” pundit shared her horror stories of terrible teachers and school principals, protected and made more arrogantly despicable due to their union-backed sinecures. Andrew Biggs suggested taking the California decision national. Biggs offered a simple four-word phrase to rejuvenate the nation’s public schools: Fire the Worst Teachers. Not every conservative intellectual liked the decision. Frederick Hess of the American Enterprise Institute warned that the judge’s power-grab could spell out a future of terrible decisions by similarly activist judges. But even Hess did not support the unions’ traditional role as the unpopular defender of teacher-tenure rules. After all, conservative school reformers have for generations identified unions as the source of all that was rotten in America’s public-education system. enjoy greater certainty of employment, greater assurance that their salaries would be paid, and a greater degree of control if government rather than parents were the immediate paymaster. Today’s conservative complaints about the power of teachers’ unions owe a lot to Friedman-esque free-market critiques. Schools suffer, free-market conservatives argue, when the market for good teaching talent is blocked by sclerotic union rules. Instead of bringing in the best teachers, unions dictate a self-interested last-in-first-out rule that preserves seniority, no matter how incompetent. But there is another reason why conservative intellectuals have long battled against the power of teachers’ unions. Those unions, after all, have resolutely supported left-leaning or even frankly leftist social programs. Perhaps the most dramatic example of this leftist tendency was the tumultuous history of New York’s Teachers Union. From the 1930s through the 1950s, as Clarence Taylor has described in his great book Reds at the Blackboard, New York’s Teachers Union wrestled with questions of communism, reform, and subversion. Again and again, the union suffered internal factional disputes, most famously the expulsion of the communist Local 5 faction. And again and again, the union came under attack for harboring subversive teachers, most famously the purge of hundreds of affiliated teachers in the 1950s. Throughout its history, though, the famous union supported left-leaning causes. Internal factional disputes were not left versus right, but rather left versus left. Even today, teachers’ unions often endure factional disputes on the left. The militant Badass Teachers Association wants to push the more moderate American Federation of Teachers and the staid National Education Association to take more recognizably leftist positions. Given all this history, why do conservative these days focus on the free-market angle? That is, why don’t conservative pundits attack unions as islands of antiquated leftist ideology, instead of just attacking unions as inefficient and self-serving? 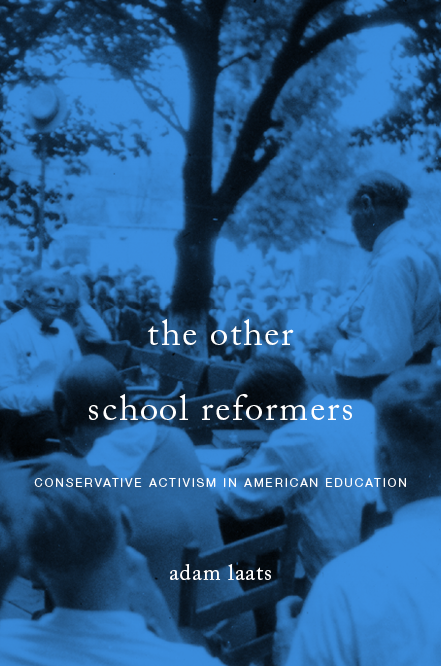 One possibility is that conservative school reformers these days take the tried-and-true school reform tactic of taking the politics out of education. As historian David Tyack argued most memorably in his 1974 book The One Best System, school reformers always insist that their ideas are not about politics, but only about better schooling for all. As Tyack showed, calls to “take the schools out of politics” never really want to take the politics out of schooling. But reformers from every political background score more success when they appear to be impartial educators, interested in pedagogy, not ideology. Is that what’s going on here? Do today’s conservative intellectuals hope to eliminate the power of leftist teachers’ unions without making it look like a politically motivated hack job? Do conservative pundits focus on the educational problems of teachers’ unions, instead of focusing on their left-leaning political positions, in order to make it look as if conservatives only want better schools for all? Maybe they want both better education and less left-leaning union power. If you can get the latter while accomplishing the former, it’s a win-win. What Agellius said, but I’d add that maybe both left and right views should be included? Does that make me a wimp? Or a defender of free speech?